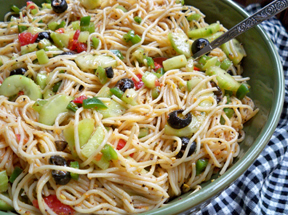 A summer spaghetti salad flavored with garden fresh tomatoes, cucumbers, and bell peppers. A terrific way to enjoy those homegrown or farmers market vegetables. Perfect on its own for a light supper or served as a side to any grilled burgers, chicken, chops or steaks. Prepare the tomatoes, cucumbers, and peppers as indicated. Break pasta in half and add to boiling water. Cook according to instructions on the package. When it is done, rinse in cold water and drain well. While the pasta is cooking, mix up the Italian dressing according to the package instructions but only use 1/2 the oil that is called for. 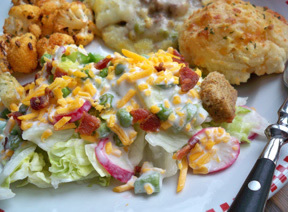 Mix the Ranch dressing mix with the 1/2 cup of olive oil and 1/3 cup of red wine vinegar. 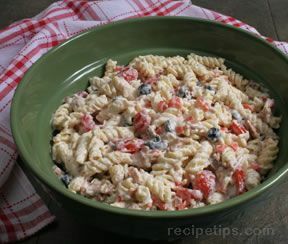 Combine the pasta, vegetables, black olives (drained), and dressings together in a large bowl. Toss until everything is coated evenly and the vegetables are distributed throughout. Refrigerate for 12 hours before serving; toss again before serving. "I liked the flavor from the peppers and cucumbers in this salad. 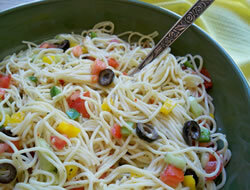 It was a good spaghetti salad but I have a couple of other recipes that I liked a little better."